In this article I’m going to address the current state of local SEO in 2016, review some findings from a new data-driven local SEO study, and provide you with some actionable tips to win the local SEO game. If there’s one thing that’s consistent about Google, it’s the fact that it’s always changing. Over the years we’ve seen many changes in local search. The most recent changes included ads that display in the 3 pack of local results, leaving only two positions. Since Google removed the sidebar ads, you now have to scroll further down the page just to see the local results. These days, local SEO is more competitive and more confusing. So where do you start? I suggest that you start by defining your primary goals. You can’t get to your destination if you don’t know where you’re going. If you’re promoting a hotel, for instance, your primary goal is probably to get more reservations — local SEO for you will mean ranking high in Google’s local results, attracting positive reviews on websites like Tripadvisor, etc. The algorithm, the amount of effort business owners are putting in, the amount of effort marketers are putting into their local SEO — it’s all changed. Where just a few years ago there were many businesses on the sidelines not doing much in the way of optimizing for local search, you now see more people trying harder. Just the other day at the gym, my personal trainer told me how his business partner figured out what was necessary to rank higher in Google’s local results. But how does Google decide which business deserves to rank higher than another when most of them have followed the same guides that preach the same basic optimization tactics? Do you see the problem here? If everyone is doing the basics now, the bar has been raised. Speaking of goals, keep this in mind: There isn’t just one way to search. #1 rankings don’t mean everything. Let’s talk user behavior for a moment, because it’s super important. Imagine you find yourself in the bummer of a situation I was in last week. I needed a plumber. To find one, I decided to turn to Google (since I spend all day there anyway) to search for a local plumber. Here’s my personal journey. Step 1: Search for a local plumber. I skip the paid ads because I feel bad clicking on them. Step 2: Look at local results. Ahh, that’s more like it! Let me click on the one with the most reviews. I like reviews. They make me feel good. Step 3: Let’s be honest — I wasn’t really happy with a 3.1 rating. I’m going to look at the finder results now. I skip over the first result and move to the one that looks the best based on the star rating. I’m in the industry, I know how people can spam these things, and yet I still like shiny objects. I find myself overly critical and biased. Step 4: After judging everyone at face value, I decide to click on Master Blaster and read the reviews. Step 5: I’m not convinced with the reviews for whatever reason. After this, I ended up turning to Yelp and reading reviews which I thought were from real people. I decided on this company, which did a great job at a fair price. My behavior seems really weird in retrospect, but it proves a point. There’s not just one way to search. Some users may not click on the first result; some will click the third result. They may click into the local pack and look at reviews. They may go to another website to check out your reviews. I think this proves my point: you need to focus on your primary goals. 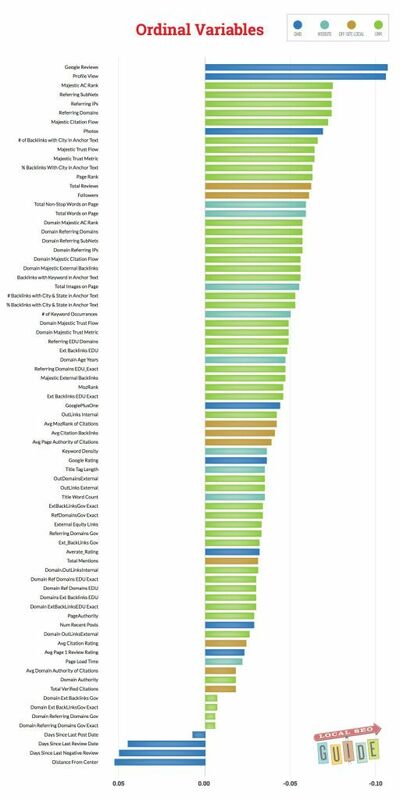 At the end of June, Local SEO Guide and PlacesScout.com published a great study on local SEO ranking factors. (Props to Andrew Shotland, Dan Leibson, and Mark Kabana.) While there are other studies that are mostly opinion-based, they looked at data to come to their conclusions (which I really like and respect). I agree. To be honest, there haven’t been very many data-driven local SEO studies done yet; I hope this is the first of many. Now, let’s look at some of the top factors from the study and break them down. 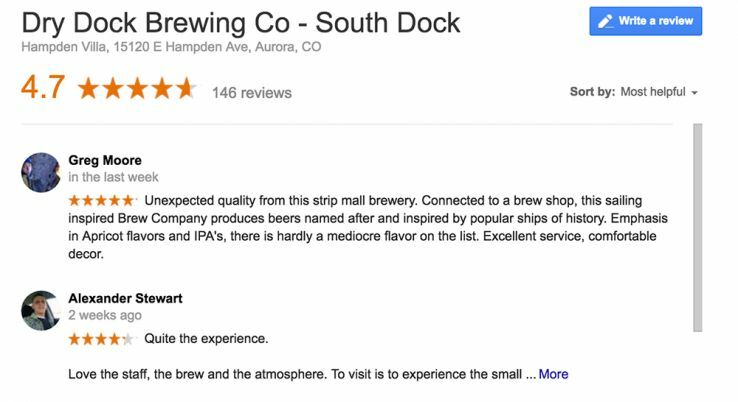 Locations with a lot of reviews tend to rank higher. Profile views correlate with higher rankings. Referring subnets had high correlation with strong local rankings. The total number of referring IP’s also had high correlation with strong local rankings. Obviously there were many more data points than those top five. You can see the whole graphic they made above, published with permission from Local SEO Guide. Now, let’s break down the top 5 local ranking factor from the study. We’ll talk more about this later, but if you do a lot of local searches you’ll also see that businesses without many reviews (or less reviews than their competitors) can certainly still rank high. If you’re new to SEO, you may not have seen some very interesting click-through rate studies done by Darren Shaw of Whitespark and Rand from Moz. There seems to be measurable correlation that, when a result is clicked more, it’s given a higher ranking. This being the case, you can see why reviews might be important and also correlate with higher local rankings. On a side note, I always click my client’s websites in the local results and stay on the page for a bit when searching. There are tons of backlink measuring tools out there. Moz has one, Majestic SEO, Ahrefs, Link Research Tools… and the list goes on. This study compared Moz & Majestic. In the future, it would be nice to compare other tools, as well, to get a better sample. Link tools don’t detect every link that Google does, as of course Google itself has the most resources for web indexation. Importantly, 3 out of the 5 top correlation ranking factors from this study involve link signals. So should you believe all of those “SEO is dead” posts? No. Links still carry a tremendous amount of weight. Not only does this study help show that, I can tell you from personal experience that moving the needle in competitive law firm niches requires good-quality links (assuming you’re doing everything else right). What was missing from the top factors? Noticeably missing from the top factors were citations and website landing page (on-site) factors. I know what you’re thinking: “But wait, Casey, everyone says to build those darn citations!” I’ll address this in the section below. Overall the study had lots of great insights. I suggest you check it out yourself and dig in when you have a chance. But now I want to shift the focus a bit and talk about what you must do to rank higher in competitive local niches. Are you ready for the top-secret super-formula we use to get our clients ranked in competitive niches? Well, it’s probably not a secret. We just work hard and take into consideration that tools are not 100% accurate. 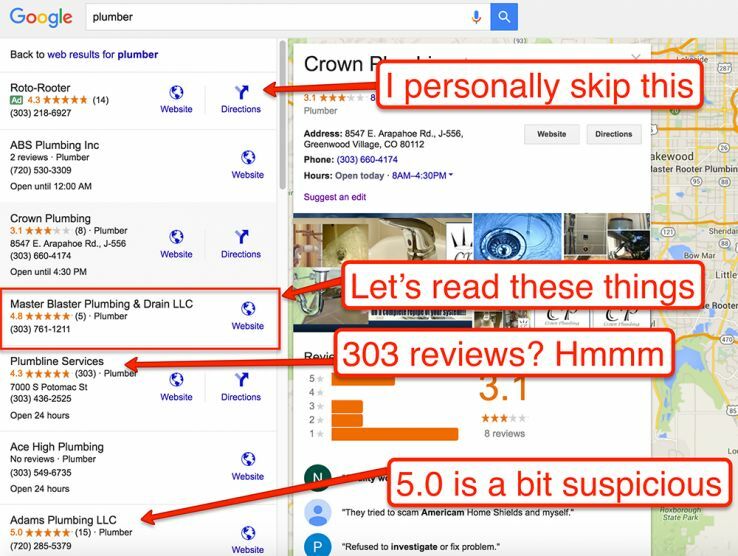 Speaking of being competitive here and beating your competition, I’m going to assume you’ve put in the elbow grease to get your Google My Business listing optimized. If not, I suggest you read the best practices in my Ultimate Local SEO Audit guide and make sure your listing adheres to Google’s guidelines. And if you’re not ranking organically for your keywords, you have a lot of work to do. Don’t expect to rank locally unless your website deserves to and does rank organically. Here are the things I look at once everything else is in order. Duplicate listings // Do you have duplicate listings for your business? Read this. You’re suspended // If you spammed GMB, check this out. You’re trying to rank for a keyword you can’t // Are you in the city of search? Keep in mind that if you’re outside the city limits you’re going to have trouble for searches using a city modifier. Incorrect categories // Bro, are your categories even right? Seriously. If your competitors are spamming, be sure to call them out. Google has made this much easier now. If you need practical advice, check out Joy Hawkins’ article The Ultimate Guide to Fighting Spam on Google Maps. Those of us working in this industry have the ethical and professional responsibility to avoid spamming local results and to report those who are behaving badly. Although I’ve been seeing more variation than normal, it still rings true that companies who rank high in organic, non-local search results will also rank high in local search results. Your organic optimization should be in order, both from a ranking perspective and a user experience perspective. Don’t treat these as separate, isolated channels. millennials like me are review-happy. According to the study, millennials “use mobile devices to read user reviews and explore information on social networks. Having grown up with mobile and digital technology as part of their everyday lives, they switch their attention between media platforms 27 times per hour.” While millennials aren’t the only user group by any means, this showcases my point from earlier: reviews are important to many. Reviews, in my opinion, can have a positive impact on rankings due to the resulting increase in click-through rates. Reviews will also help you build trust in your business and earn more business. 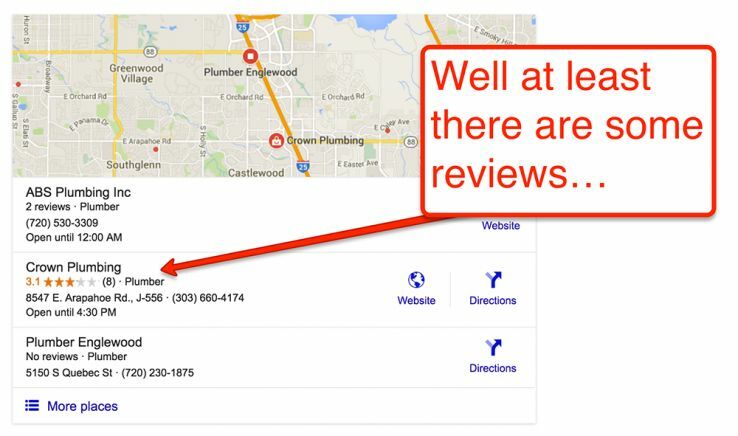 I’m excited that the next big local SEO study is slated to take a deeper look at reviews. If you haven’t already done so, you need to be sure you’re getting customer reviews. They need to be built into your business processes. It’s as simple as that. If you don’t have a review strategy, you’re going to struggle with this forever. If you’re in-house or need a solution for your clients, check out a review service like Get Five Stars. It’s easy to use and allows you to easily streamline reviews from your customers. It also allows you to easily add a review widget on your website. If you’re using your own marketing system like Infusionsoft you can generate direct review links for your emails by using tools like this one. This will bring up a direct link to the “leave a review” screen for your business if your user is logged into Google. Check out the sample link we created for ourselves here. One thing I like to do for my legal clients is add reviews on the website. 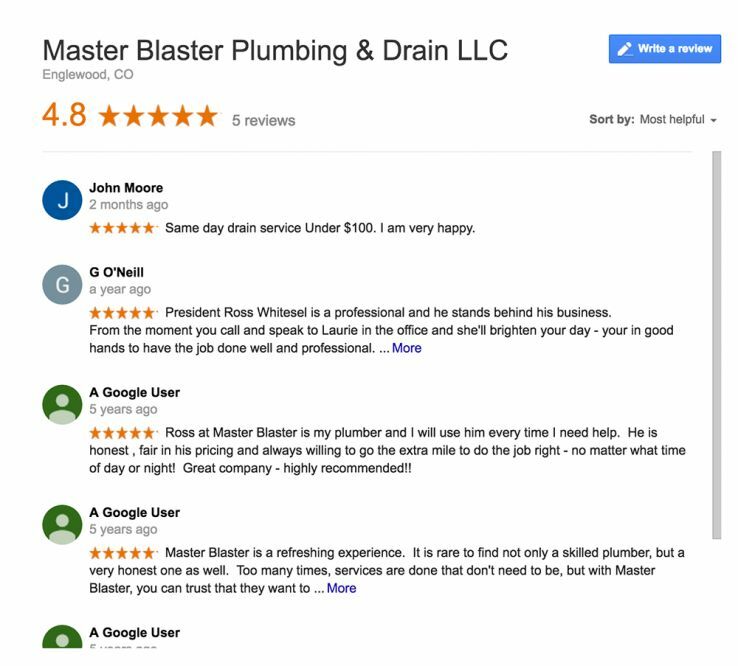 Not only do we like to add yellow stars, customers’ faces, and quotes on actual website pages, but we also like to add the review schema to help get stars in organic search results. Although this is more of a conversion rate and organic play, you should try it. I bring up on-page and technical SEO because of the shocking number of people I speak with who say things like “Well, I don’t care about organic SEO, I just want to show up on the map.” That’s still a common misconception. Try to be the best in all of your marketing efforts and you’ll be rewarded for doing things the right way. How’s your site speed? If you don’t know how Google sees your website’s site speed, check out their mobile-friendly test here. Is it bad? Is it slow? If you get traffic to your website, you’re probably missing out on conversions unless you’re taking site speed and usability into consideration. What’s the conversion you care about? 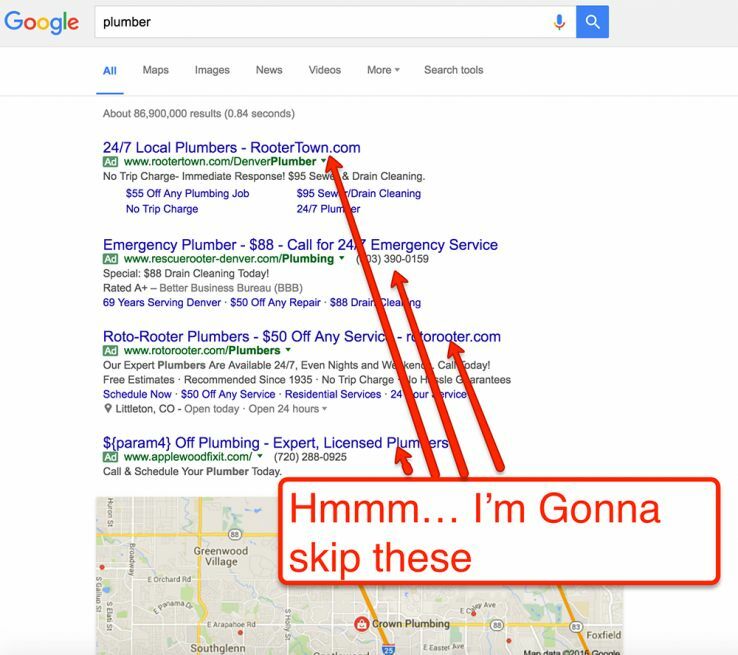 Now ask yourself this question: “If I was given a list of search results with an ad, my business, and one competitor, would the user click on my result before the others? And once they’ve clicked, will they be satisfied with the results?” If the answer is no, you have to consider why. It’s nice to have a high ranking for an important keyword, but you have to think about the customer journey. If the user sees your listing, clicks on your website, and then bounces back to click on another result, how does that look? Why would they do that? It’s probably because a) they couldn’t easily find the information they need, b) it took too long to load, or c) there were usability issues. As I mentioned above, citations were notably missing from the local ranking factors study. This is probably because Google’s gotten much better with data and data sources. Devaluing citations as a ranking factor has been a discussion in the local SEO world for quite some time. I’m in the camp that citations should be cleaned up, but probably won’t help you much outside of the basics. Here are a couple of thoughts to go along with that. First off, many citations are links, or have a place to add a link. Those sources where your link is hidden between millions of businesses and given a nofollow aren’t really going to help you move the needle, in my opinion. At the same time, you have to value your citation sources as link sources, too. Second, you still need to correct the data at the data aggregator and top citation levels because of potential bad data issues. If you’re a new business, you can just create these and go. If you’re an established business that has moved in the past, you need to get this stuff right. Why? It wouldn’t be the first time I’ve seen an incorrect listing created off of bad or old data. If a new Google My Business page is created off of this bad and old data, you’re going to shoot yourself in the foot. Alternatively, if there aren’t a lot of signals sending bad or wrong info, you should be fine. Just sign up for Moz Local to fix this issue — it’s super easy to use. Third of all, you can still get business from 3rd-party websites. Like the example I gave earlier, if you’re promoting a hotel, you want to be listed on TripAdvsior. This provides value towards your primary goals. You don’t need to be listed on ThisAwesomeHotelBookingWebsiteThatNobodyWillSee.com. I will say that you should only really focus on the top citations, though. Let’s face it… Nobody is visiting YourCitysIndustryDirectory-CitationSourceofAwesome.org, which is ranking on page 47 for your city and industry keywords. I’ve done that in the past. Don’t get that tunnel vision. Focus on what’s going to make a difference. Outside of the top citations, be sure to turn your attention to links instead of citations to avoid diminishing returns. I have not seen an example where getting more low-quality citations helps a business rank better in local results… but I have seen quite the opposite with link penalties from low-quality websites. On a side note, also make sure your citations are indexed. I recently did a study that showed an automated platform didn’t work that well. “The top thing you can do to move the needle in local SEO today, in my opinion, is to build authoritative links. After working with a client who received a nasty manual penalty a few years ago, I changed how we get our links for our clients. If you can get your city name or type of business in the anchor text naturally, then that’s great. Don’t overdo it though. Now, let’s get you 4 links that are legitimate for your business. Dedicate 10 minutes every morning to read the daily emails from HARO. HARO stands for Help a Reporter Out and it’s awesome. Daily there are a couple of emails that come through from journalists looking to interview experts. The business owner or even an employee of your company should be able to get a request. Don’t be afraid of failure or rejection and pitch often. Here’s a great starter guide for getting links using HARO. Find a cause that’s dear to your heart and sponsor the organization. Many causes list sponsor logos and links to their websites on their local landing pages. If you host your own event, you can usually get listed on the town’s website (if it’s a community-approved event). You know about the top citation sources. Now Google your city name and see which websites rank for your city. Does the chamber of commerce? Join. Does the BBB? Join. Are there city-specific directories? Join. 4. Run a community initiative; give back. I work with a lot of law firms these days and we’re always looking for ways to give back to the community. Some of our more successful campaigns this year are free cab ride programs on holidays, toy drives, and food drives. These are all ideas that get media exposure and are real marketing ideas. Need more links? Check out Point Blank SEO’s guide on link building here; it’s a very good list for any industry. If you’re a law firm in need of links, check out these specific resources. If you’re having trouble moving up in the SERPs to at least that number 3 position, remember that it gets harder to rank the higher you get. The people competing in that landscape are probably investing resources. You don’t have to outspend their resources, but you do have to outsmart them. In addition to this, I believe that Google’s much slower than it used to be. The effects of the links you do get may take longer to have a positive effect. Focusing on more ways I can earn links and boost my authority ← This is my top tip! Keep in mind that tools are imperfect. If your metrics look better on one tool versus another, that’s not a stopping point. It’s a point where more effort needs to be put in to figure out what you’re missing. Broaden your toolset, rack your brain, and work to outsmart the people trying to outsmart you.